When Paula Lucas, a Catholic farm girl raised in the agricultural heartland of California met an internationally known foreign photographer in San Francisco shortly after college, her life transformed. She spent fourteen years living and traveling overseas in Europe, the Middle East and the Far East. A dream comes true as an American expat, except she hid terrible secrets that almost cost the lives of her children and herself. 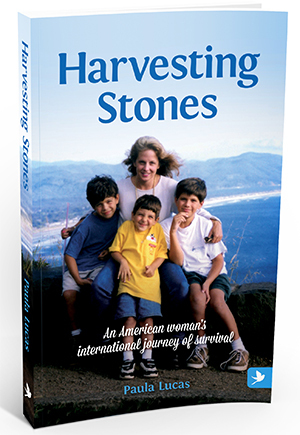 The night before she fled Dubai in April 1999, she made a covenant with God that she would help other American women and children being terrorized in foreign countries if she successfully escaped the next day. She did. Seeking safety at her sister’s home in Portland, Oregon, she thought her nightmare would end. It didn’t. She was forced to flee once again. Homeless and on the run at forty years-old with three little boys, they lived like gypsies along the California and Oregon coast hiding from the man that threatened, "I will hunt you down and slaughter you like animals no matter where you are in the world." From victim to victor, Paula weaves you through her astonishing life journey for the first time since her escape almost fifteen years ago in this tell-all memoir.